Pistachios are the one type of nut (other than honey roasted peanuts) that we enjoy eating plain. Our dad introduced us to them when we were younger, and we’ve always liked them. Well, one day, we were sitting around thinking of recipes and thought of pistachio white chocolate chunk cookies! This quickly evolved into shortbread, and we started hunting down a good recipe to use, which we adapted slightly by adding a little almond extract. 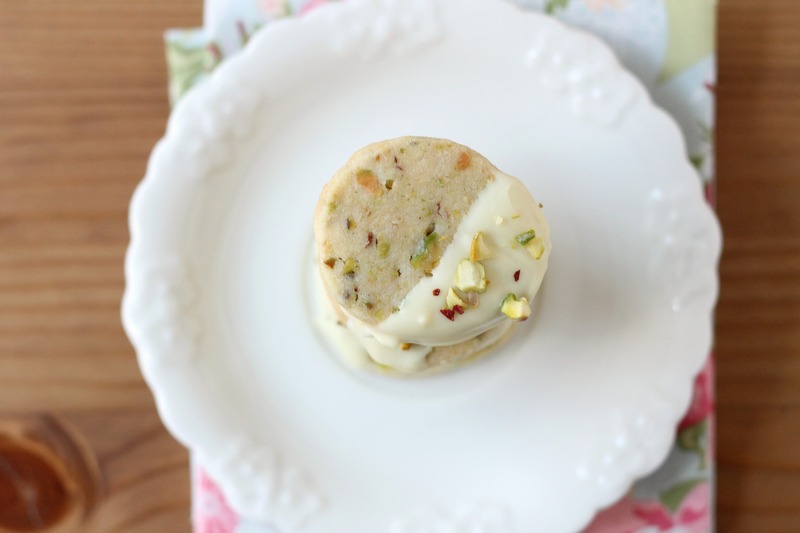 We ended up dipping the final cookies in white chocolate and topping with more pistachios for a delicious cookie that is both elegant and easy to make! Mix flour, powdered sugar, and salt in processor. Add butter, pistachios, egg yolk, and vanilla. Pulse until a moist ball forms. Transfer dough to work surface. Divide dough in half. Form each dough half into 8 x 1 1/4-inch log. Wrap logs in plastic; refrigerate until firm, about 4 hours. Preheat oven to 325°F. Slice logs into 1/4-inch-thick rounds, rolling log after every few slices to retain round shape. Place rounds on ungreased baking sheets, spacing 1 inch apart. Bake shortbread until barely golden, about 18 minutes. Cool shortbread on baking sheets. While cookies cool, melt the white chocolate in a double boiler. Dip each cookie into the white chocolate. If need be, add a couple drops of canola oil to thin out the chocolate enough for dipping. Top with more pistachios. Let set, and then serve. Store in an airtight container for up to 4 days. Enjoy!